Is It Safe to Pickle Eggs in a Plastic Jug? Pickled eggs are a welcome addition to a salad, perfect for quick snacking and make tangy and unique egg salad. While pickled eggs are extremely flavorful and versatile, the actual act of pickling eggs is quite simple and can be done with minimal equipment. A rigid food-safe plastic jug can be suitable for pickling eggs, although glass jars are the most recommended vessel for this project. 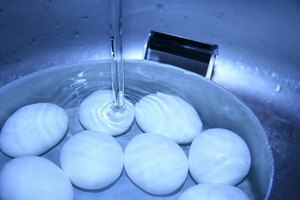 Pickled eggs are typically made by adding hard-boiled, peeled eggs to a solution of water, vinegar, salt and other spices. 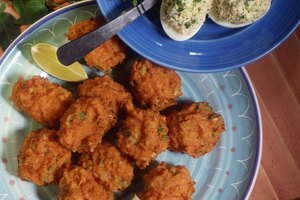 They are relatively simple to make, requiring little more than boiling a few ingredients and pouring the cooled mixture over the peeled eggs. Pickled eggs typically require one to three weeks to fully cure and develop their flavor, making it necessary to use a container that can stand up to this long-term storage in the refrigerator. 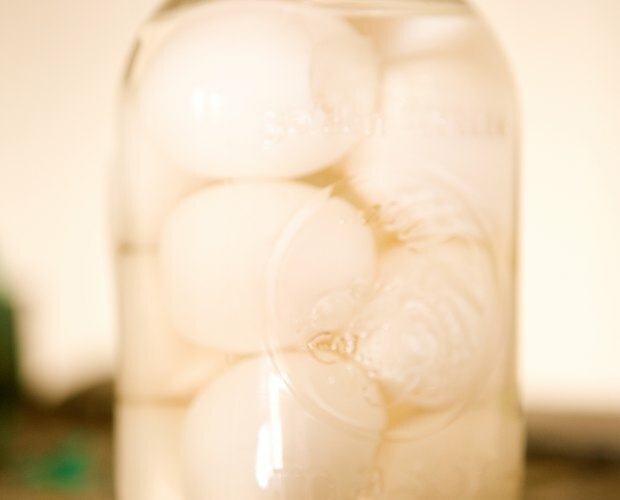 Pickled eggs are preserved in an acidic solution, making the container that they are pickled in important to prevent corrosion and off-flavors. The most common recommendation for a pickling container for eggs is a glass jar. When using a quart jar, one dozen large chicken eggs fit perfectly, making storage simple. However, it is possible to use a rigid food-grade plastic container for making pickled products. Polycarbonate, HDPE and PP plastic containers are all appropriate for brining eggs; these are commonly sold as food-service containers, food-safe plastic buckets and coolers. Ensure that whatever vessel you use also has a tight-fitting lid that is made of a nonreactive material. Pickled eggs are susceptible to food spoilage and botulism when improperly stored. Whatever container you use, it is important that the eggs are always immersed below the pickling brine. Choosing a pickling container that is adequately sized to fit your pickled eggs and brine is important. Do not allow pickled eggs to sit on the counter or out of the refrigerator except during serving time. They should not be left in the danger zone of 40 to 140 degrees Fahrenheit for more than two hours to prevent the harmful growth of dangerous bacteria. To speed up the pickling process, pierce eggs several times with a fork through to their yolks before adding them to your pickling vessel. Using smaller quail eggs or bantam chicken eggs is also a viable option when you want to quickly pickle eggs, as the smaller size makes for quicker pickling. Pickled eggs can be safely stored in your refrigerator for three to four months, though they will become rubbery after this extended storage. Begin tasting your pickled eggs after a few days in the pickling brine and eat them when you feel they taste sufficiently pickled.